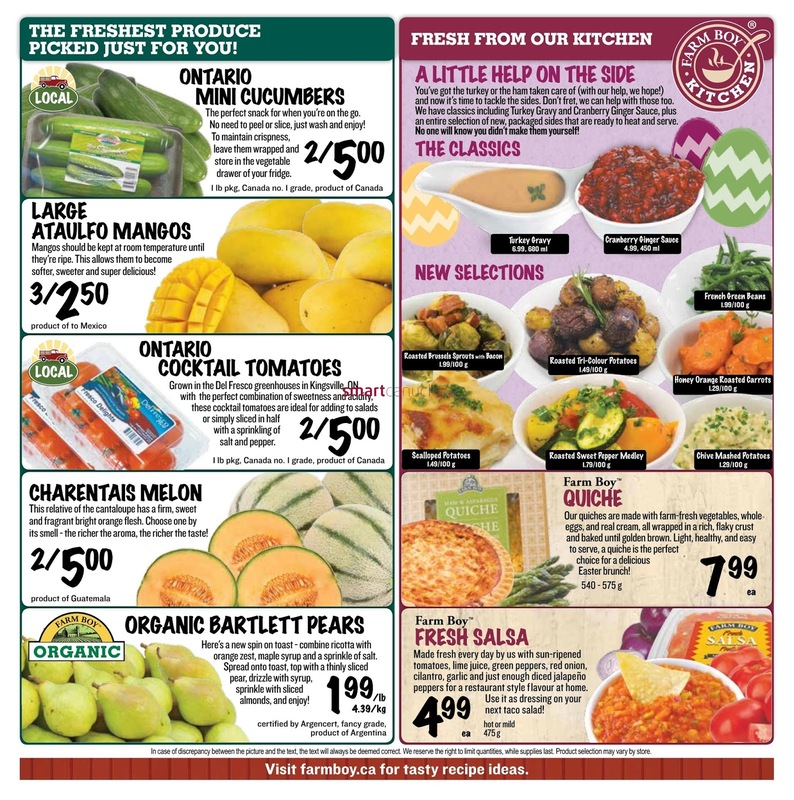 Farm Boy fresh flyer April 13 to 19. Specials in effect from thursday, April 13, 2017 to Wednesday April 19, 2017. 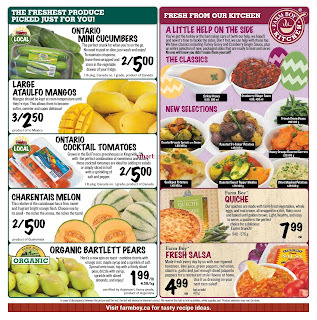 Valid at Farm Boy Stores in Cornwall, Kingston, Ottawa, Pickering and Whitby. All stores closed Friday, April 14 and Sunday, April 16. The freshest produce picked just for you! Ontario mini cucumbers the perfect snack for when you're on the go, No need to peel or slice, just wash and enjoy! To maintain crispness leave them wrapped and store in the vegetable drawer of your fridge 1 lb pkg. Canada no. 1 Grade product of Canada price 2/5.00. Large ataulfo mangos Mangos, Mangos should be kept at room temperature until they're ripe. This allows them to become softer, sweeter and super delicious! Price 3/2.50 product of Mexico. Ontario Cocktail Tomatoes Grown in the Del Fresco greenhouses in Kingsville on with the perfect combination of sweetness and acdify, these cocktail tomatoes are ideal for adding to salads or simply sliced in half with springkling of salat and pepper price 2/5.00. A little help on the side You've got the turkey or the ham taken care (with our help, we hope!) and now it's time to tackle the sides. Don't fret, we can help with those too. We have classics including Turkey Gravy and Cranberry Ginger sauce, plus an entire selection of new, packaged sides that are ready to heat and serve. No one will know you didn't make them yourself. The classics Turkey Gravy 6.99, 68 ml. Cranberry ginger saouce 4.99, 450 ml. and more you can see on last page or flyer page 4 for details flyer.